Multi-Platinum, Grammy nominated recording artist Big Sean announces the opening of his first ever pop up shops, with a four city take over in NY, LA, Detroit and Toronto. Named after Big Sean’s upcoming fourth solo studio album, "I Decided. ", the multi-city shops will open on Friday, February 3rd, the same day as the release of the album. The three day, retail shopping experience is powered by Shopify, a multi-channel commerce platform that lets anyone sell anywhere. 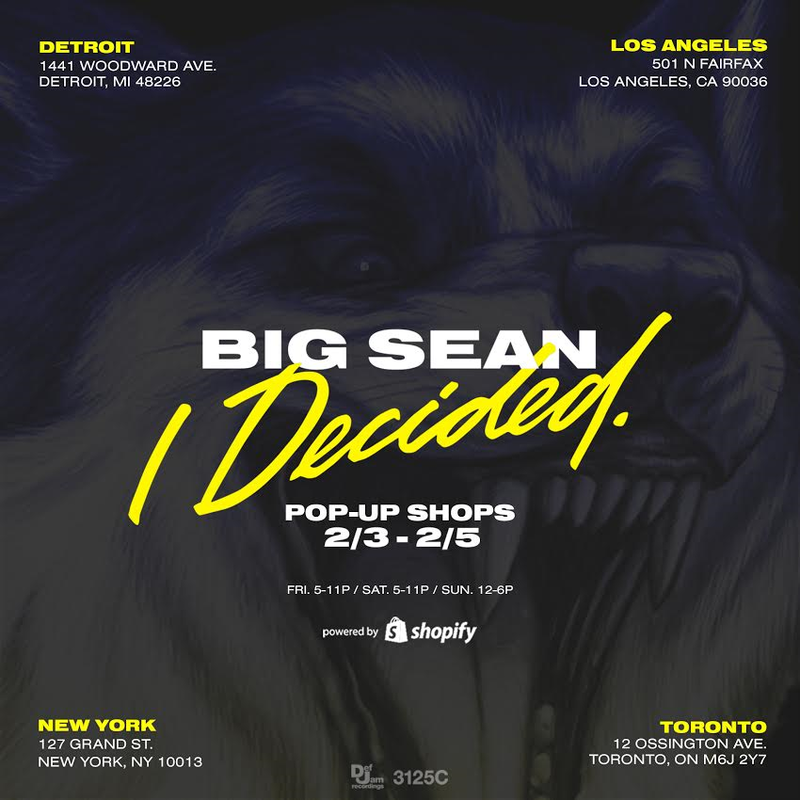 The pop ups are an extension of Big Sean’s brand, offering a visual and fashionable interpretation of "I Decided." Each piece reflects his artistic expression and all designs are inspired by Sean’s graphic wordplay throughout the highly anticipated album. Ranging from $30 - $200, this limited edition collection includes t-shirts, hats, hoodies, sweats, bombers and more. 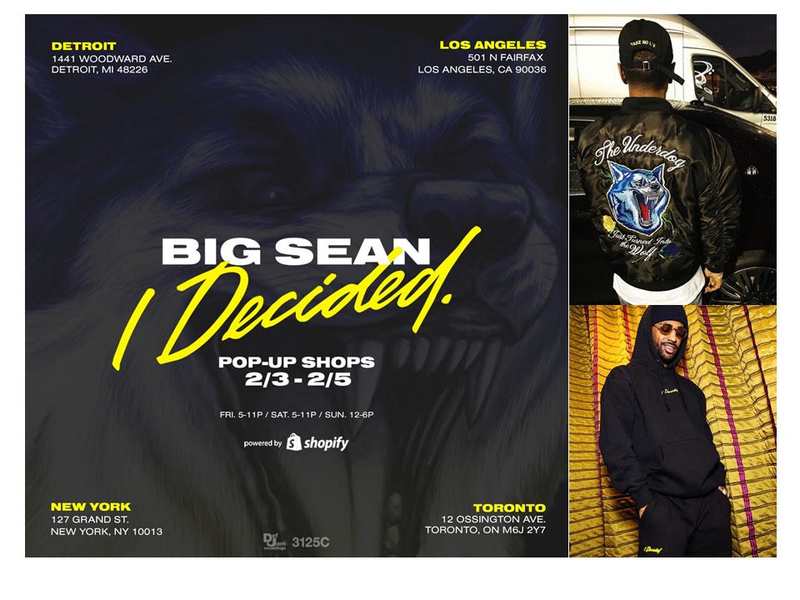 To further elicit the celebratory appreciation of the album, commerce giant Shopify partners with Sean to amplify his first ever merch shops, embodying his personal style as a fashion innovator and trendsetter. 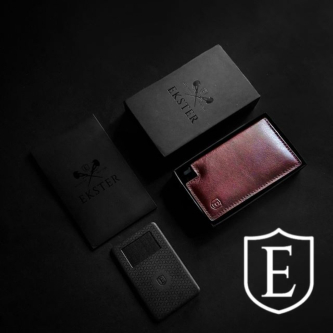 Using its POS system, Shopify brings the brand to customers in real life, and lets entrepreneurs securely sell products using tap, chip or swipe technology. The 3 day "I Decided." pop up shops will be open Friday & Saturday: 5-11pm and Sunday: 12pm – 6pm. 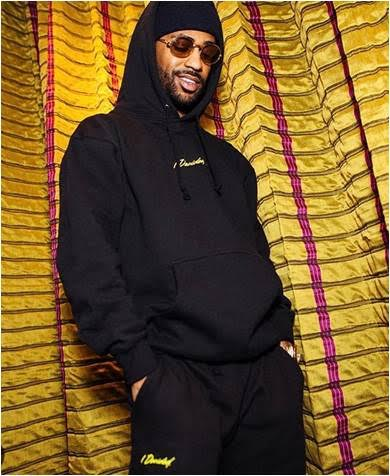 With over a quarter-billion YouTube views, 7-time BET Award-winning and Grammy® nominated superstar Big Sean has enjoyed a massive career in hip-hop since he emerged in 2011, with his debut album Finally Famous on Kanye West’s G.O.O.D. Music/ Def Jam imprint. The album spun off consecutive top-charted pop/R&B/rap crossover smashes with “My Last” featuring Chris Brown (RIAA gold), “Marvin & Chardonnay” featuring Kanye West and Roscoe Dash (platinum), and “Dance (A$$)” featuring Nicki Minaj (3x-platinum). Sean was a major collaborator on Kanye’s groundbreaking Cruel Summer album in 2012, and shared multi-platinum success with Kanye on the Grammy®-nominated “Mercy” (also featur­ing Pusha T and 2 Chainz), and “Clique” (with Jay Z). Sean’s Hall Of Fame album followed in 2013, including “Guap” (platinum) and “Beware” featuring Lil Wayne and Jhené Aiko (gold). 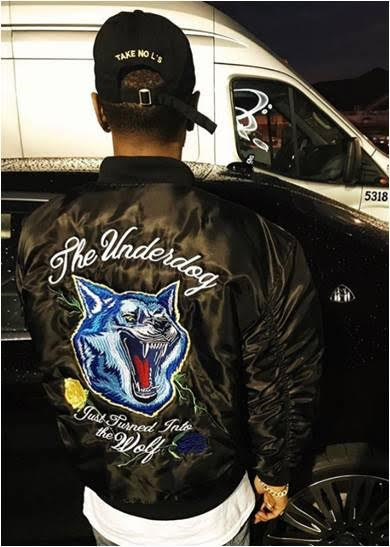 Dark Sky Paradise (2015) was Sean’s first platinum and first album to debut #1 on Soundscan. 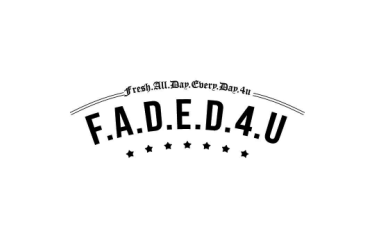 It ruled the charts with the #1 “IDFWU” featuring E-40 (3×-platinum), “Blessings” featuring Drake and Kanye West (2×-platinum), and “One Man Can Change the World” featur­ing Kanye West and John Legend (gold), for which Sean also won his first VMA. He co-headlined J. Cole’s mammoth 27-city Forest Hills Drive Tour of the U.S. and Canada in July-August 2015 with fellow Def Jam MCs YG and Jeremih; and supported the European (closing) leg of label mate Rihanna’s 2016 ANTI tour.